After the disastrous events at Woking the other night, when the game was called off fifteen minutes into the second half, the Harriers will be hoping for a slightly longer game against Salisbury City and a positive result too. The weather conditions down that way haven't improved over those found further East on Tuesday and already last nights game between Weymouth and York City became another victim of the damp conditions. It should have improved by Saturday though and a good wind could do wonders in drying the ground out. Salisbury went through a bad spell a few months ago and looked to be in danger of folding and they appealed to the fans and local businesses to help them through the sticky patch. They were also forced to release players in an effort to reduce the wage bill and it seems to have worked in one respect because they have stopped the alarming slump in form that was seeing them hovering dangerously near the relegation zone. 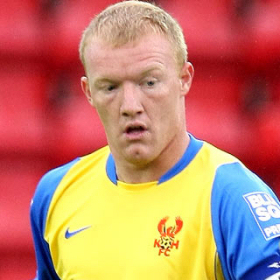 One player leaving the Ray Mac was the former Harriers keeper Ryan Clarke and he is now with Northwich. Another player leaving was the highly rated Liam Feeney who has now joined relegation candidates Bournemouth in League 2. They have now bought in a couple of loan defenders to help to stop them losing games and Chris Todd and Michael Brough have joined them from Torquay Utd. Initially on a month long loan these have now been extended until the end of the season. They should be at full strength for the game with Ian Herring now back from a one game suspension for collecting yellows and Rob Sinclair back from a two month lay-off due to a thigh injury. Sinclair you may remember as the long haired lad that ran rings around our defence in the 3-2 victory over City back in December. We'll still be without Andy Ferrell (above) and now it looks like it's going to be until the end of the season before he plays again. According to last nights E&S his knee problem is worse than first thought and the cartilage is badly damaged. Apart from Fez it's just Craig Armstrong missing though suspension but I'm not quite sure that his three weeks will have to start from tomorrow now after the original first date was supposed to be against Woking. Does that called off game actually count as day one or not? If it doesn't count then why is the Woking defenders, Konan, booking still valid! The FA make it up as they go along. We will have Justin Richards back from injury. After all he did make it to the bench on Tuesday and came on for two minutes. We could have Stefan Moore back in the side too now that he's recovered from his ankle injury. This is going to be a tough game to call and I'm going to go with what I said prior to the fated Woking game. We need to go out and win every game against lesser sides such as Salisbury if we intend to get back into the play-offs. It's a win or nothing. Porter, Bittner, Bass, Todd, Brough, Fowler, Tubbs, Herring, Widdrington, Davies, Clarke, Dutton, Sangare, Griffin, Clohessy, Harris, Maher, Ruddick, Ademeno, Webb, Martin, Sinclair.